A National Save our NHS March will take place on Sept 29th outside the Conservative Party conference in Manchester. 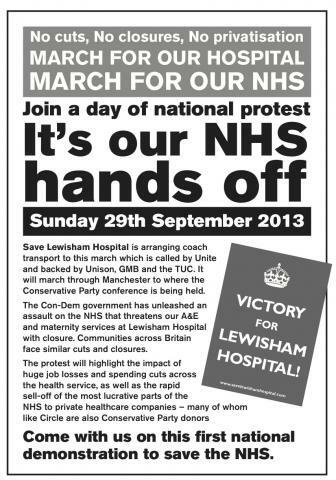 The Save Lewisham Hospital campaign has booked a large coach to go to Manchester for the march. There are two pick up points, 6.45am at Lewisham Station or 6.15am at General Gordon Square in Woolwich. Tickets cost between £5 and £17 depending on how much you are able to pay. Email Paul Moore, Lewisham TUC, if you’d like to purchase a ticket at paul.moore@cwuglc.org.